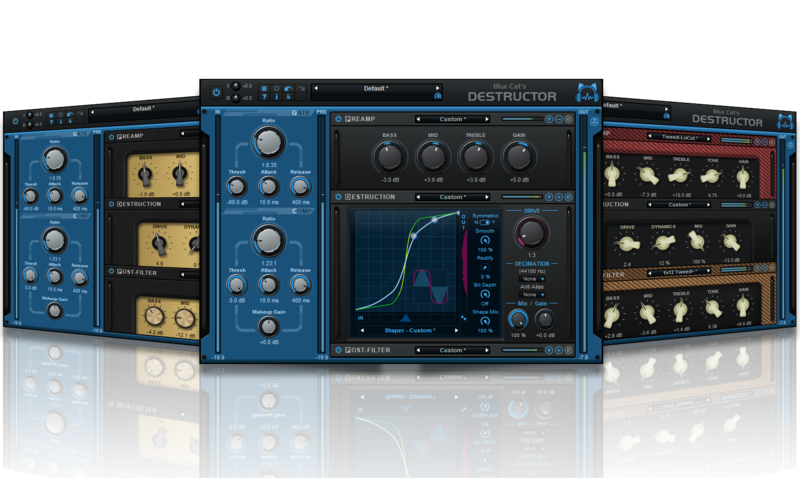 We are happy to unveil today our new plug-in, Blue Cat’s Destructor, a comprehensive distortion and amp sim modeling tool capable of simulating any kind of distortion. It will be demoed on booth #410 at the 141st AES Convention in Los Angeles until October 2nd and will be available for purchase on October 11th. This new plug-in gives access to an unlimited number of non-linear processing models, ranging from harsh digital destruction to smooth analog compression or guitar amp simulation (and it works for clean tones too). It is delivered with hundreds of presets and predefined models, many of them inspired by real gear. It offers the ability to create completely custom distortion simulations beyond these models, thanks to its flexible yet simple signal processing chain – no need to purchase extra presets or amp models to build the perfect custom tone. Based on a perceptual model rather than on electronic designs or impulse responses, it simplifies the process of tweaking the tone and making it fit into the mix. Thanks to its exclusive adaptive shaper, it is reactive to the playing of instrumentists, providing a very natural feeling, similar to analog gear. In order to make the look and feel of the plug-in match the tone, the plug-in is bundled with more than 1400 visual styles that can be selected separately for each module. Check out the Blue Cat’s Destructor plug-in page for more details! This entry was posted in New Releases, Videos and tagged Destructor by bluecat. Bookmark the permalink.